Pope Francis will spend Sunday, the final day of his visit to Lithuania, in the cities of Kaunas and Vilnius. The high point of the visit will be Holy Mass celebrated by the Holy Father at 10 a.m. in Kaunas in Santakos Park. People not only from Lithuania, but also from Belarus, Poland, Latvia, Russia and other countries, will start gathering there to await the Pope already very early in the morning. Immediately after the Mass, the Pope will lead the Angelus prayer, as he typically does on Sundays in St. Peter’s Square, introducing it with brief considerations based on Scripture and concluding with special greetings. The Vatican broadcasts it worldwide, this time from Kaunas. Pope Francis will have lunch with the bishops of Lithuania in the Palace of the Curia of the Archdiocese of Kaunas. After that, the Holy Father will meet in Kaunas Cathedral with priests, men and women religious, consecrated persons, and seminarians from the three Baltic countries. On returning to Vilnius, the Pope will stop to pray at the Vilnius ghetto. The tribute to victims of the Holocaust coincides with the 75th anniversary of the liquidation of the Vilnius ghetto in 1943. Recalling that tragic event, Lithuania observes September 23 as the Day of Remembrance of Lithuanian Jewish Victims of Genocide. For that reason, the state flag at the Presidential Palace will fly at half mast, and throughout the country the Lithuanian flag will be displayed with black mourning ribbons. Toward evening, the Holy Father will visit the Museum of Occupations and Freedom Fights, located in the building in Vilnius that was the headquarters of the Gestapo during the Nazi occupation of Lithuania in 1941, and from 1944 to 1991 was the prison and offices of the Soviet secret police (KGB). Archbishop Teofilius Matulionis, whom Pope Francis beatified last year, was imprisoned there. 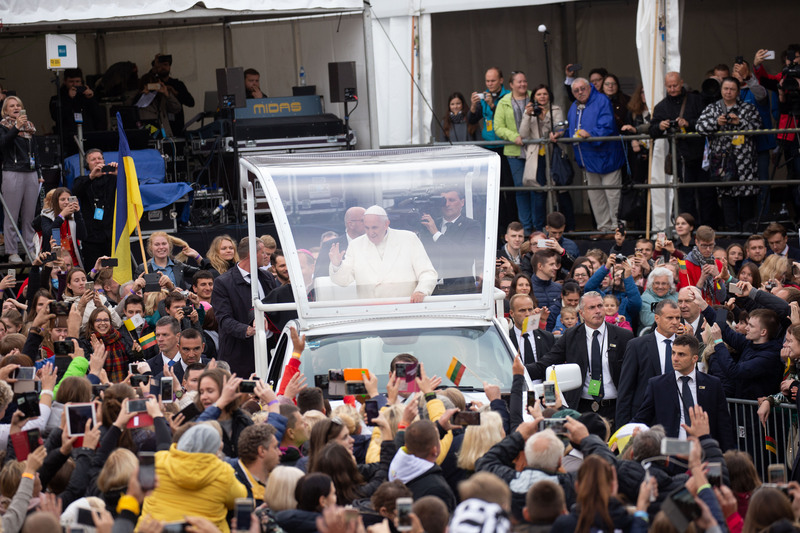 The Pope will be met by representatives of people in Lithuania who endured exile and political imprisonment, and will pray at a nearby monument to the victims of the Soviet occupation.